My first introduction was through Nelson our 1st maremma, sadly he was a pet-shop pup and since we got him in 2001 I have worked endlessly to stop pet shops selling maremmas (but that's another story). Nelson was brought up in a suburbia environment and he took to it like a duck to water. Nelson was a sick pup (another long story) but I found the Original Yahoo Maremma Group owned at the time by Katrina and Janet, I believe. I sourced a lot of information and advice from everyone...Linda was invaluable at that time as she was always offering sound advice...as was most people, but Linda did take a special interest in Nelson and my need to gain as much information as possible. We moved from suburbia for Nelson and moved to 7 acres (crazy I know LOL) and again he took to it like a duck to water, we got him a baby lamb that had been dropped by the ewe and we bottle-fed the lamb in a small enclosure and allowed Nelson in under supervision. Nelson took to guarding Maddie the lamb so well, he would show submission to the lamb and would crawl on his tummy to lick the lamb (I do have photos of this and will try to add them to our Tassie Album). Nelson was never imposing and took it all in his stride. Sadly, Nelson did not survive for long through his deformities - he lived 4 short years - but they were good years for him. Since Nelson was my teacher we have successfully integrated Wellington and Gianna as guardians for our sheep and goats...it was all done slowly and initially under strict supervision. We have inherited 3 *grandchildren* who look on Roger and I as Grandparents and the maremmas idolize the kids, and yet they had never been around kids before. Once again, the introductions to the children was done slowly and carefully and fully supervised, Now the girls aged 9 and 7 actually clip butterfly hair clips to Wellie's ears and fur around his neck and he doesn't budge...he looks embarrassed and blinks uncontrollably when he notices us smiling at him as he lay there with clips on his ears and fur!! This is how we have encouraged the bonding of the maremmas to humans and animals and it has worked for us this far. 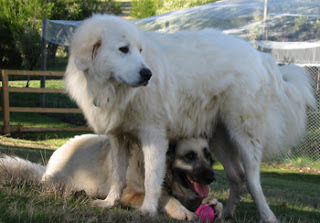 I hope any new maremma owners will just come right in here and ask questions, there are so many people here that will willingly offer any advce if asked - I could not have gotten through the teething years had it not been for the help from the folk on here..
How should I introduce my teenage maremma to young children that visit our home? He is normally very good with new people when we invite them in. I find one of the main things is to educate the children! Explain to them that he is a lovely dog but doesn't realise he is so big, and that they should always be very gentle with any animal. See it as an opportunity to teach the child something about the right way to respect animals. Encourage your maremma then to meet the children, but to sit or stand quietly, then it can help to have the dog leave for a bit. Let the children then get settled in arriving at our home. Maremma looks like an interesting breed of dog.